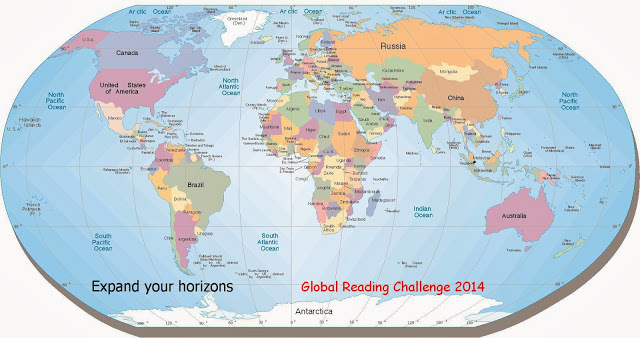 I completed the Global Reading Challenge with a few weeks to spare. I only took on the easy level this year, meaning one book for every continent, and that was the right level for me. I could spend enough time trying out books set in different countries without feeling like I was scrambling to meet the requirements. For my “seventh continent” I chose a historical crime novel. And here are my reads. I’ll save my favorite reads of the year for a separate post. It took quite awhile for me to find a translated crime novel from Asia I’d like to finish for the Global Reading Challenge– a problem I ran into last year as well. First of all, there aren’t so many crime novels written by Asians that are translated into English. Secondly, I tried a few novels I just wasn’t in the mood to read because their tone was too noir (Yoshida) or or something I can’t quite label (Higashino). Despite the very disturbing cover, I liked this book. The story centers on a missing persons case: injured and recuperating police detective Honma investigates his cousin’s son’s fiancee’s disappearance, and the story revolves around overextended consumer borrowers who are harrassed by legal and yakuza bill collectors. From the description, the cover image seems a little on-the-nose. The story is a bit slow and the plot relies a bit heavily on coincidences, complaints I feel like I make with other missing-persons novels, but Honma is an engaging character. Since he’s on leave from the police department, the book doesn’t get into office dynamics and instead focuses on his homelife with his young son and nanny (he was widowed a few years before the novel takes place). Two aspects of the story make it feel particularly Japanese, one major and one minor: first is the background of the Consumer Finance Scare of the 1980’s, and second is Honma’s reliance on bullet trains. The easy credit part of the story is crucial to the missing persons case, and it sounds an awful lot like the housing bubble of the 2000’s. And the existence of bullet trains and the communities that grow around them stands out for me since I live in a part of the world without widespread train service. Other reviews appear in Complete Review, Petrona, and Black Plume. I’m a bit ambivalent about reviewing this book because I nearly gave it up after the first 200 pages (there’s a big shift in tone then), but ultimately I decided to finish it to see what the book was trying to do as a whole. I think Roncagliolo intended the book to be so brutal for a reason, but it made for an uneasy read. I chose to read this book because it’s hard to find books about or from Peru translated into English, because it’s won a couple big literary awards, and because it was billed as a sort of crime novel. Conspiracy thriller actually seems a bit more accurate because the murder near the beginning of the novel seems like a small part of the story until the final section of the book. But this is most definitely not crime novel. The main character is a prosecutor who willingly left Lima for a provincial town of Ayacucho, and he deals with a stifling bureaucracy to investigate a murder in an area where Shining Path is supposedly inactive. This book is about the crimes perpetrated by the terrorists and the government trying to quash them, and along the way there are also a series of murders in the region. The novel is horrifying in terms of the bureaucratic obstacles to Chacaltana’s investigation into the murders, it’s horrifying in terms of the remnants of the 20 year conflict between Shining Path and the Peruvian government, and it’s brutal in terms of the series of murders that Chacaltana investigates. The action is a bit strange and unbelievable, but the aura of violence feels real. I think my real ambivalence about the book comes from the fact that I didn’t expect there to be any hope at the end, and my assumption was correct. I’m glad I read it, but I’m ready for something less serious and brutally violent next. Other reviews appear in Novel Insights and Reading Matters. I chose to read the second Inspector Sejer novel because I wanted to try a new-to-me author of a well-reviewed series, and I’m glad I did despite being burnt out by police procedurals in general in the last several months. The first novel in the series, Eva’s Eye, also published as In the Darkness, was published in 2013 in the US, but I’ve had book 2 waiting on my shelves for awhile so I chose to read it first. Sejer is a widower still mourning the loss of his wife to cancer, and in this novel he works with Skarre, a young policeman half his age. Their district is large, covering a population of over 100,000 people, while the scene of the crimes at the heart of the novel take place in an incredibly small mountain town. The subject matter of the book is pretty off-putting: a very young girl is missing in the first chapter of the book but found safe, and in the second chapter of the book a teenage girl is found dead by a mountain lake. Because the crimes took place in such a small community, there’s a bit of a locked-room feel, and there’s a bit of peeling away of people’s facades as Sejer and his colleague Skarre interview lots of residents. The stories Sejer and the rest of the police uncover are quite sad, and they lend emotional depth to the investigation. Despite the sadness of the story, Sejer himself doesn’t seem overly gloomy, which is appealing in a protagonist. He feels empathy for the people he interviews not only because they were touched by the crimes at the center of the novel but because of their lives together in their small town. I’m glad I have several more novels in the series to get to soon. Other reviews appear in Confessions of a Mystery Novelist and Reactions to Reading and The Crime Segments. I’m joining the 2014 Global Reading Challenge at the easy level (one book from each continent), and I’ll try to read from as many countries as I can throughout the year, regardless of the continent. I’ve added a countries visited page to keep track of how diverse my reading is by setting. Now I need to get to updating the page. I’m also joining the 2014 USA Fiction Challenge, and I’ve added a states visited page to track my progress over the coming years. My main goal for this challenge is to read books that don’t take place in New York and California. My two reading challenges for the year are perpetual challenges for me because I’d like to add a bit more flexibility to my reading choices than I had last year. I’d like to return to some favorite authors I’ve discovered since I started blogging and reading crime blogs, I’d like to dig into my own bookshelves a bit more, and, like I mentioned last summer, I really want to read more books published for 2000. So what can you expect over the next few months? Lots of translated crime novels, the occasional non-crime novel because I’m getting a bit burned out by crime reading, some authors I first read in 2012, and nothing too noir.